More (blog) connections spotted. Something new about diphenyl magnesium? Firstly, I will hypothesize that since C3 needs to lose a hydrogen, the easiest way of doing so is to form the enol of Ribulose-1,5-bisphosphate. I am going to start by reducing the above model to its core; C1 and the attached phosphate is replaced by a methyl, and C4-5 likewise. In this model, it takes 13.1 kcal/mol of free energy to enolize., This species can then react with CO2 (potentially with an accompanying proton transfer) to give 3-keto-2-carboxyarabinitol 1,5-bisphosphate directly. The transition state at the ωB97XD/6-311G(d,p)/SCRF=water level has an IRC (intrinsic reaction coordinate) that reveals the activation barrier is ~17 kcal/mol with respect to the enol (19.5 in ΔG298), with the overall reaction being exo-energic by -2.6 kcal/mol with respect to the enol, but endo-energic by +10.5 kcal/mol with respect to keto-Ribulose-1,5-bisphosphate + carbon dioxide. Note the characteristic feature at IRC -3.0 of a hidden zwitterionic intermediate, which marks a belated proton transfer occurring AFTER the transition state for C-C bond formation. The reaction is asynchronous for this basic model. 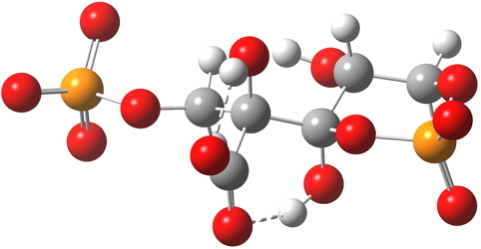 For this very basic (phosphate-free) model of Ribulose-1,5-bisphosphate, the total computed free energy barrier@298K is 32.6 kcal/mol (standard state of 0.041M; reduced by ~1.9 kcal/mol for more concentrated, e.g. 1M solutions). This is ~13 kcal/mol too high to correspond to a uncatalysed fast process at room temperatures, a gap that the phosphate end-groups and the enzyme have to address (a challenge typically enzymes do manage to achieve). Note the network of hydrogen bonds formed at the transition state geometry (below) and the various gauche stereo-electronic alignments which you should really explore in the Jmol 3D model invoked by clicking below. or on the barrier to reaction with carbon dioxide. But, they DO provide a new low energy sink I have not seen described before for the reaction (below), which makes the overall process from Ribulose-1,5-bisphosphate + CO2 exo-energic by -7.3 kcal/mol. Thus the phosphates provide the overall thermodynamic driving force for the carbon fixation. The enzyme can help increase the effective molarity of the bimolecular reaction between Ribulose-1,5-bisphosphate + CO2. As noted above, increasing the concentration from e.g. 1 atmosphere (0.041M) to 1M reduces ΔG† by 1.9 kcal/mol. The most influential role the enzyme could play is to bind the enol form of Ribulose-1,5-bisphosphate preferentially over the keto form. If most of the substrate is bound in this form, that would reduce the overall barrier by 13 kcal/mol, more than enough to enable a room temperature reaction. There may of course be many other subtle effects in operation, such as preferential stabilisation of the transition state, which cannot be inferred here without a detailed knowledge of the enzyme. I have deliberately tried to avoid doing that, since I wanted to see what might be concluded purely from the energetics found above. There is one final step required; a very rapid decomposition of the 3-keto-2-carboxyarabinitol 1,5-bisphosphate (cyclic or not) to produce two molecules of 3-phosphoglycerate. I will leave my computational-energetic analysis and mechanism of that step to another post. Postscript. An IRC on the full phosphate model took three days to run and has only just finished. The profile is similar to that obtained for the phosphate-free model, with the exception of the IRC feature at -13, where one phosphate group rotates and starts to H-bond to the 3-keto-2-carboxyarabinitol, resulting in a lower energy conformation than that reported above. The energy of this new conformation relative to the starting point (labelled as 0.0 above) is +2.3 kcal/mol (c.f. +11.5 for the previous conformation). The phosphates clearly remain a strong driving force for the reaction. It is quite possible that even more stable forms of this product could be found (by varying where the acidic protons reside) but at least we now know that the product can be more stable than the reactant (by at least -7.3 kcal/mol), which is the important conclusion. Postscript 1. Yet another lower energy isomer of the product has popped out being -13.1 kcal/mol lower than the initial reactants. ‡I do not describe much molecular biology on this blog, but an urge to rectify this was inspired by a TV program I watched four days ago charting how the pathway chronologically known first as the Calvin, then the Calvin-Benson and now the Calvin-Benson-Bassham cycle for carbon fixation became known (and how it gradually gathered attribution). As a chemist who was trained to try to understand reaction mechanisms, my immediate question (unsurprisingly not addressed at all in the TV program) was: what is the key carbon-carbon bond forming step? Here, I simply wanted initially to answer that one simple question and perhaps the aspect of the relative timing of any C-C bond formation and associated proton transfer. This latter idea in turn was hovering in the background of my mind from association with our previous project in proline-catalysed aldol reactions, where a similar question can be posed and indeed has been answered. The rest of what you see here led directly from trying to answer that initial question. Peter Medawar’s 1963 talk Is the scientific paper a fraud? presented the argument that scientific journal articles give a misleading idea of the actual process of scientific discovery. I hope that perhaps as a blog post, the above does give a little insight into the scientific process I experienced for myself over a period of the last two days (and with conclusions which may of course turn out to be quite wrong). This entry was posted on Sunday, April 20th, 2014 at 5:04 pm and is filed under Interesting chemistry, reaction mechanism. You can follow any responses to this entry through the RSS 2.0 feed. You can leave a response, or trackback from your own site. Another way of looking at this reaction is as the reverse of the familiar beta ketoacid decarboxylation. Ribulose-1,5-bisphosphate + carbon dioxide → carbon fixation! is licensed by Henry Rzepa under a Creative Commons Attribution-Noncommercial-Share Alike 3.0 United States License.